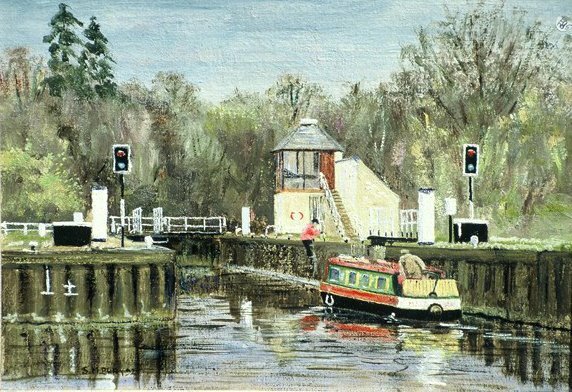 As long as I can remember I have painted, even when, many years ago, I had a “proper job” nursing. Since 1981, after 13 years abroad, first in Canada then the Middle East, we came to live in South Yorkshire where I now work from my home beside the River Don. 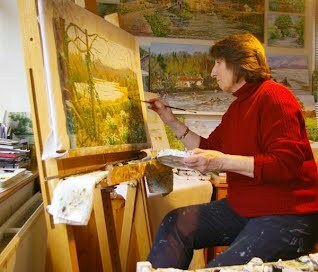 I paint the local landscape and waterways, a large nature reserve close by with lake and woodland, birds and wildlife. The many different types of river craft passing - sometimes mooring up a while in the still waters of the cut, and the stunning views all year round. The seasons and weather influence my work , the fresh sunlight of a summer morning, the ‘in your face’ colours of autumn, and the fresh greens of spring. Frost and snow bring a magical quality to the scenery with long spiky fingers of hoar frost , and always the reflections of light on the water. I cannot resist the urge to paint these things.